You may be thinking that a pedicure is more self-care than a fashion statement, but hear me out. Great style starts with being comfortable in your own skin, figuratively and literally. Even if no one sees your pedicured feet, an exfoliator, moisturizer, and buffer can do wonders for the way you look and feel. While you’re working on your pedicure, give your hands a little love too. If you’re a busy mom like me you are probably washing your hands a dozen times a day, and it’s leaving you with dry skin. A manicure might even remind you to wear gloves when you’re washing dishes, and wash your hands a little less. Nail polish is one of the most inexpensive winter fashion upgrades. 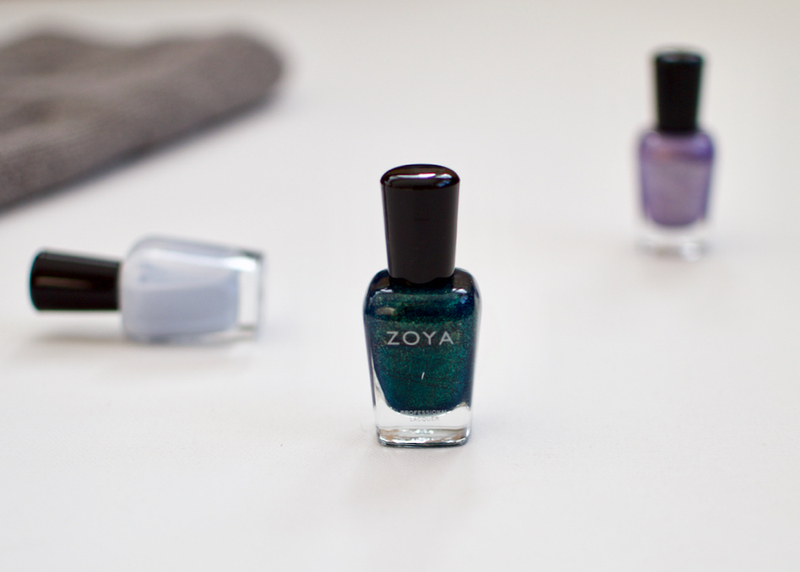 I like to use clean beauty products, so my favorite brands are Zoya, Mineral Fusion, and Butter London. If you want to be well ahead of the fashion trends, you can even try out Pantone’s 2019 color of the year, Living Coral well before fashion brands have introduced it in their clothing and accessories. If there’s a color that you’ve wanted to try, but aren’t sure about, nail polish is a low-risk way to try it. During the rest of the year, I try not to rely on my leggings so much, but in mid-winter, they’re almost a necessity. I wear fleece-lined ones for warmth, yoga ones to work out, and everyday ones which tuck nicely into my snow boots. Some of my favorite leggings are from Lululemon and have lasted me almost ten years. Athleta is a more affordable option especially if you can take advantage of their sales. These very stretchy navy tights are the mid-rise Salutation capris which are on sale for under $50. (The black/pink ones are Lululemon from several years ago). If you’re looking for leggings under $30, take a look at Uniqlo’s printed leggings or Heattech leggings. I bought the kids’ versions for my daughter, and even after a dozen washes, they both look as good as new. Read this post to see why I like Uniqlo more than other fast fashion brands. A belt is an easy way to add a little color, sparkle or pattern to your style. 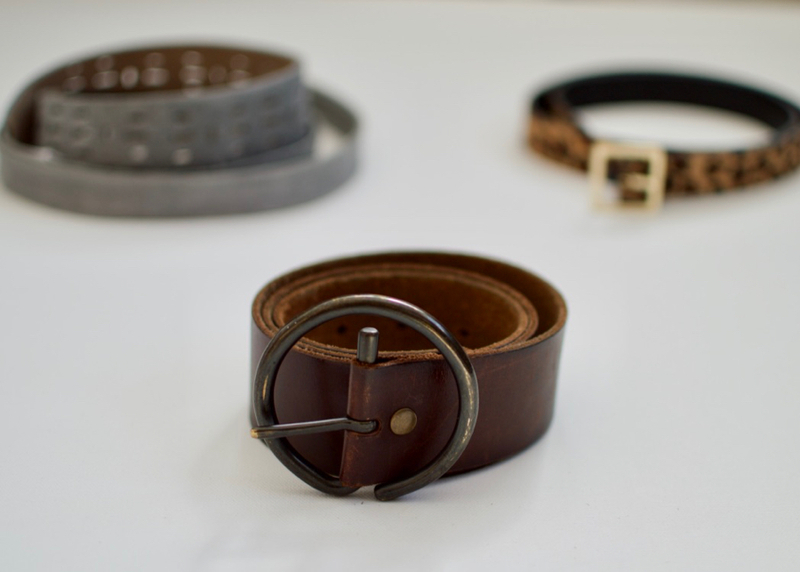 If you have a shorter torso, try wearing your belt a little lower with mid-rise pants or jeans. If you have a longer torso, wear it at your natural waist which is the most narrow part of your middle. My favorite belt is this rugged, brown leather, curved belt (so I wear it at the lower part of my waist) from the GAP. It’s from many moons ago but Free People’s Eternity leather belt is similar. The animal print belt on the right is also an old style from the GAP. Their circle buckle belt comes in a similar print and is currently available online. If you have a longer torso take a look at Free People’s Aston Snake Bite belt. Is zebra your animal print of choice? Then you’ll love this Banana Republic zebra print haircalf belt. Anthropologie’s Trifecta belt is in a deep rich red that would dress up a black sheath dress or sweater. If pink is more your style, this Kate Spade smooth bow belt currently 60% off at Nordstrom. I’m always working with my hands, so I usually only wear my wedding band. Then a few years ago, I received this Alexis Bittar ring in a Box Of Style subscription and always throw it on when we have a party or dinner to attend. A stacked ring adds a lot of sparkle without being too fussy to put on. Ellie Vail’s Sadie ring is similar. 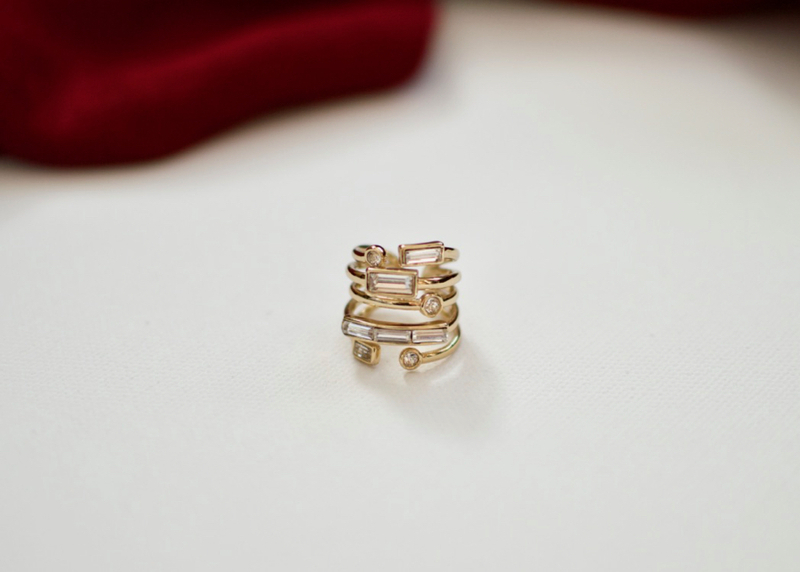 This multi-band ring by Selahvie is a simpler version. If you like to mix and match your own rings, you could also stack three rings like these Monogram rings from Anthropologie. Yes, I’m going to talk about moisturizer again. If you don’t regularly use a lip balm in the winter, you may want to switch to a moisturizing lipstick. My favorite is Mineral Fusion lipstick which includes shea butter and jojoba seed oil. I also like Bite’s Matte Creme Lip Crayon which seals in moisture with orange peel wax and is narrow enough to fit into an envelope clutch handbag. For color, the fall runway shows and the recent red carpet appearances showed us that both nudes and reds rule the beauty scene. This post by MindBodyGreen has some great suggestions for under $50 lip colors in bold, deep reds. In the summer, I let my hair air dry, which allows it to fall into natural waves, and saves it from heat damage from blow drying. In the winter though, it’s too cold to go outside with wet hair so I find myself washing it less. Add sweaty yoga classes, hats, and pony-tails and the result is a bit of a mess. I like to have a few hair accessories on hand to tame my unkempt hair. 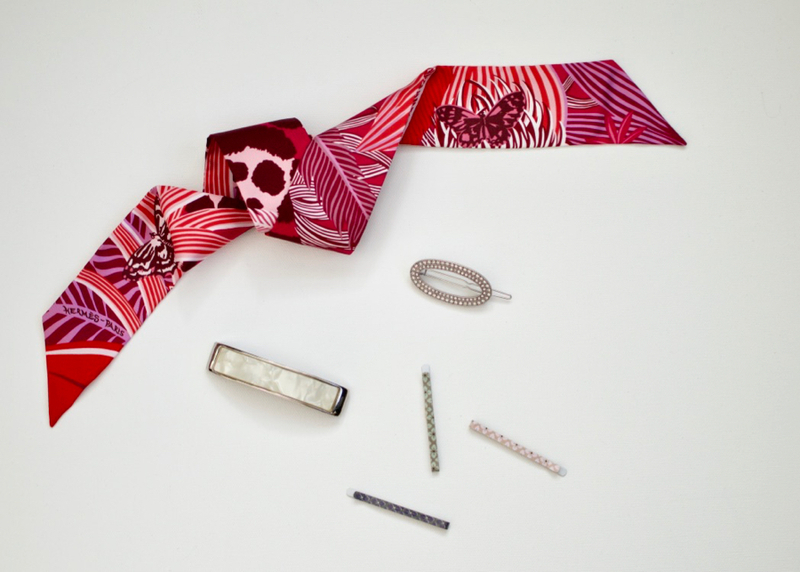 I wouldn’t tie my (over $50) silk scarf into unwashed hair, but the bobby pins and barrettes have saved me from looking like a vagrant more than once! Anthropologie is one of my favorite stores for hair accessories. I love this Lola ponytail scarf and this jeweled barrette. J.Crew has a silk everything tie (hair tie, neck scarf, and bracelet) in a leopard print that is under $50. Madewell has a velvet bow scrunchie that will give your basic ponytail an instant upgrade. If you have short hair, your winter fashion upgrades can include these bobby pins, headbands or even this “statement” rhinestone pin! Maison Miru’s Juliet ring is currently $54. I saw this Kate Spade Hayes Street pearl wristlet in a store and would have loved it in a brighter, bolder color. If you’re looking for a black or pink clutch, this style adorable. I love the versatility of skinny scarves (for your neck, wrist or handbag) especially this Ted Baker Houdinii silk scarf. Do you have some winter fashion upgrades that I haven’t mentioned? Let me know in the comments below! This is a great style perk up! A new fragrance is another good way to give yourself an incentive to get out of winter mode. Have you tried this natural nail polish? Thanks, Susan. I haven’t been able to find that brand in the U.S. but will give it a try if/when it arrives! Really great article. It is very informative for us. Thanks for posting.